ATHENS – A Greek pensioner's suicide outside parliament has quickly become a symbol of the pain of austerity and has been seized upon by opponents of the budget cuts imposed by Greece's international lenders. The 77-year-old retired pharmacist, Dimitris Christoulas, shot himself in the head on Wednesday after saying that financial troubles had pushed him over the edge. A suicide note said he preferred to die than scavenge for food. 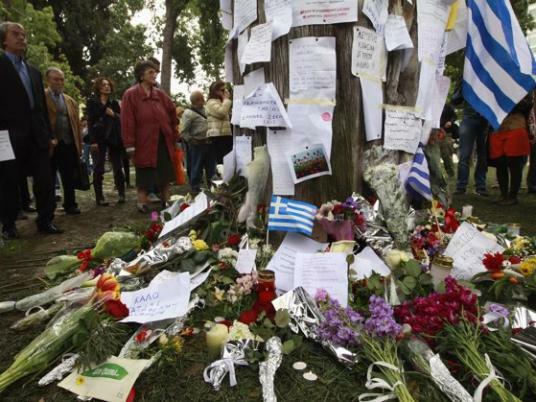 The highly public — and symbolic — nature of the suicide prompted an outpouring of sympathy from Greeks, who set up an impromptu shrine where he killed himself with hand-written notes condemning the crisis. Some protested at night, clashing with riot police who sent them home in clouds of tear gas. On Thursday, dozens of Greeks gathered around the shrine, leaving flowers and candles, and the "Indignant" protesters who held daily sit-ins for months last year said they would stage a second day of protests. A separate demonstration was planned in the northern city of Thessaloniki. The conservative newspaper Eleftheros Typos called the victim a "martyr for Greece." His act was filled with "profound political symbolism" that could "shock Greek society and the political world and awaken their conscience" before a parliamentary election to determine Greece's future, it said. Anger over the suicide was directed as much at politicians as it was at the harsh austerity medicine prescribed by foreign lenders in return for aid to lift the country out of its worst economic crisis since World War Two. "It's horrible. We shouldn't have reached this point. The politicians in parliament who brought us here should be punished for this," said Anastassia Karanika, a 60-year-old pensioner. So far this week, police reported that at least four people have tried to kill themselves because of financial troubles. In one case, a 35-year-old cafe owner in central Greece was hospitalized in a critical condition on Tuesday after drinking pesticide because he feared his business would be seized by the bank if he failed to pay his mortgage. With the election likely to take place on May 6, smaller parties opposed to harsh spending cuts included in the country's second bailout were quick to point the finger of blame at bigger parties backing the rescue. "Those who should have committed suicide — who should have committed suicide a long time ago — are the politicians who knowingly decided to bring this country and its people to this state of affairs," said Panos Kammenos, a conservative lawmaker who recently set up the Independent Greeks anti-austerity party. Smaller parties like the Independent Greeks have been riding high in opinion polls before the election at the expense of the two main co-ruling parties, the conservative New Democracy and socialist PASOK, which backed the bailout. The two big parties are together expected to take less than 40 percent of the vote. Losing more voters to the smaller parties could put them at risk of not having enough seats in parliament to forge a pro-bailout coalition again. That in turn would have profound implications for Greece's finances as continued aid from the European Union and the International Monetary Fund depends on the next government pushing through reforms. "The main issue is not the suicide itself but the reasons behind it," said Thomas Gerakis from the Marc pollster group. "The problem is far more serious than a single suicide. It shows that there is a serious — and growing — problem of people in despair." New Democracy and PASOK, which have ruled Greece for decades, expressed their sorrow for the tragedy. Political opponents attacked them for joining in the mourning. "Shame on them. The accomplices responsible for the suffering and despair of the Greek people … should at least keep quiet in the face of the hideous results of the capitalist crisis and their policies, instead of pretending to be saviors and sensitive," the KKE Communist party said. Resentment is rising in Greece over repeated rounds of wage and pension cuts that have compounded the pain from a slump which has seen the economy shrink by a fifth since 2008. The IMF, which is unpopular among many ordinary Greeks for demanding the austerity together with the EU, said on Thursday it was saddened by the pensioner's death. "We are deeply saddened to learn of any death under these circumstances … just to express our sympathies," IMF spokesman Gerry Rice told reporters during a regular news briefing. Unemployment has surged to a record 21 percent — twice the euro zone average — with one out of two young people jobless. The number of suicides jumped 18 percent in 2010, and many Greeks feel ordinary people like the retired pharmacist are being forced to pay for a crisis that was not of their making. "When dignified people like him are brought to this state, somebody must answer for it," said Costas Lourantos, head of the pharmacists' union in the Attica region.